Mayor Rahm Emanuel and U.S. Secretary of the Interior Sally Jewell recently toured the Michele Clark Academic Preparatory High School on Chicago’s West Side. Michele Clark is one of Chicago’s five Early College Science Technology Engineering and Mathematics (STEM) Schools, which use public private partnerships and community college classes to provide students with an ambitious curriculum and accelerated resources in realizing their college and career goals. .
“In Chicago, Early College STEM schools are another high quality option available to parents to ensure their children are receiving the necessary education foundation to go to college and the skills to succeed in this highly-specialized, 21st century economy,” Mayor Emanuel said. 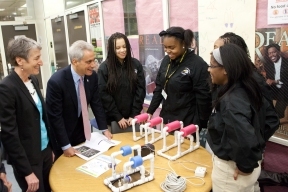 As part of President Obama’s ConnectED Initiative, all five of Chicago’s STEM high schools have state of the art labs and facilities with 1GB Internet connections to connect students to next-generation broadband in schools and libraries. Mayor Emanuel and Secretary Jewell were joined at Michele Clark by Jerry Rocco of Cisco, the industry partner of Michele Clark High School’s Early College STEM School Program. Each of the Early College STEM schools has been paired with a corporate partner that provides mentors, internships, and feedback on the curriculum to teach skills that would be valuable at their company. The other four corporate partners include IBM, Microsoft, Motorola Solutions, and Verizon Wireless.